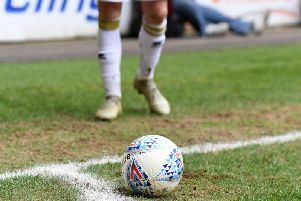 Another Wieger Sietsma howler has all but ended MK Dons' time in League 1 after they went down 2-0 at Bradford City on Tuesday night in Keith Millen's first game in charge. The Dutchman, who has made costly mistakes in each of the last three games, spilled what appeared to be a routine save into the path of Nat Knight-Percival late in the day for Bradford to wrap up the victory at Valley Parade, after Timothee Dieng headed the home side in front after 12 minutes. Dons had looked the a much improved side after Saturday's disastrous 4-0 defeat to Southend, which ultimately cost Dan Micciche his job. Results elsewhere mean Dons live to survive another day, but must win on Saturday or their fate will be sealed. Keith Millen's first game in charge immediately saw changes to the side. Dean Lewington - an ever-present under Dan Micciche - was dropped to the bench in favour of a new centre back trio of Elliott Ward, Scott Golbourne and George Williams, who also took over the captain's armband. Knowing the stakes - Dons had to win and hope Oldham and Rochdale didn't do the same - the visitors started brightly on the soggy Valley Parade pitch and could have been ahead inside eight minutes when Chuks Aneke thumped the bar from Marcus Tavernier's corner. But such has been Dons' fortune this season, Bradford would score with their first attack. Alex Gilliead's effort from 18 yards was deflected just wide of Wieger Sietsma's goal, but the resultant corner sailed all the way to the back post where Timothee Dieng was on hand to head in after 12 minutes. Unlike in recent weeks though, Dons didn't let their heads drop after conceding. Ugbo and Tymon were forming a good partnership on the left-hand side, while Marcus Tavernier showed far more of his abilities than he did at Southend on Saturday, skidding an effort just wide after good work from Ed Upson in midfield. Despite Dons looking the better side for the majority of the first half, Bradford nearly doubled their advantage seven minutes from the interval when Kai Bruenker struck a volley on the turn into the ground, and Sietsma had to be patient to watch it loop up before tipping it over the bar. The second half followed a similar pattern to the first with the visitors having the better of the tie. Josh Tymon forced a low save from Colin Doyle early in proceedings, while Aneke headed Cisse's cross just wide despite being crowded out by several Bradford defenders. At the other end, Bruenker missed another great chance, spooning his effort high over the top from eight yards after a decent ball into the mixer from Gilliead. Dons' troubles shave hardly been helped by the performances of keeper Wieger Sietsma of late, and the latest in a string of shockers came with 10 minutes to go, handing the game to Bradford. With the ball breaking towards him in the six-yard box, the Dutchman raced out to collect but somehow spilled it straight into the path of Nat Knight-Percival, who was left with an empty net to lash in Bradford's second.